Spooky fun for the whole family in and around La Grange, IL! Who doesn’t love Halloween? Kids dream up fantastic costumes and fantasize about bags and bags of candy. And grown ups, whether you take the kids trick-or-treating or stay in and pass out treats to the strange assortment of ghouls and goblins (and superheros and princesses) at your doorstep, Halloween is surely a time to bring out the kid in you. 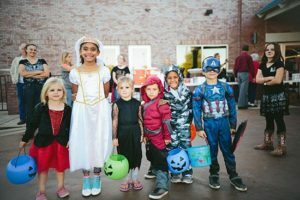 Every year, the La Grange Business Association sponsors the October Halloween Walk, which brings out over 1500 kids and caregivers for a walking costume parade downtown. Local businesses hand out treats and costume compliments, and the parade ends with pumpkin bowling and other crafts. The Halloween Walk begins at 10:00 a.m. on Saturday, October 27 this year. The Greater La Grange YMCA will lead the parade, starting at Cossitt School Playground. Families need to start lining up at 9:30 a.m. The parade ends at noon on the lawn near the fountain at Village Hall. 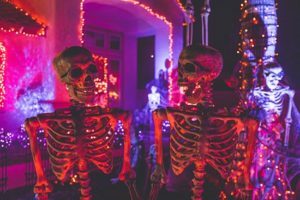 And since October is Skeletober in La Grange, you can see friendly, life-sized skeletons all over town inviting you in to local businesses. Be sure to take your picture with one or more of them, and tag the La Grange Business Association and the business behind the skeleton when you post them on Facebook, Twitter, or Instagram for a chance at prizes. Use #skeletober. Rather ride for Halloween fun? Join La Grange Park residents from 4:00 p.m. to 6:30 p.m. on Friday, October 26th for a Haunted Trolley Trick or Treat. The La Grange Park Chamber of Commerce organizes this event each year for families to hop on a Haunted Trolley and enjoy spooky stories and yummy treats. Hop off for some trick-or-treating at scheduled stops. This year the stops include the La Grange Park District, and local businesses the Village Market & Phillip’s Flowers, Central Federal, Premier Design, and Cabinets & Tile. All this fun, and it’s free! I told you last month about all the great work The Community House does in Hinsdale, but I didn’t tell you about their wonderful Fall Family Fest. This one happens a little earlier than most Halloween festivities, which means you could bring the kids to this one and hit up some other fun events later. On Saturday, October 20th, The Community House will hold a Halloween costume contest from 11:00 a.m. to 2:00 p.m. (works around nap time for the little ones nicely, doesn’t it?) They will be offering 500 free pumpkins and decorating supplies on a first-come-first-serve basis. They will also have carnival games, inflatables, and other entertainment for the whole family. And don’t forget to take the kids trick-or-treating downtown between noon and 3:00 p.m. If, that is, you haven’t exhausted yourselves already! 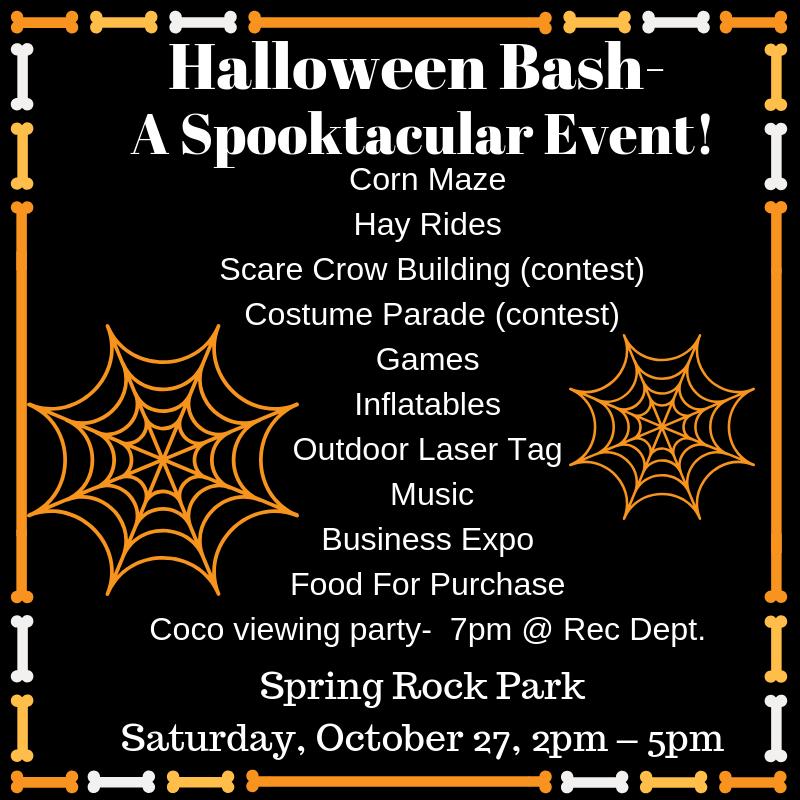 Start your Halloween fun in Western Springs as the WS Park District’s Halloween Bash at Spring Rock Park on Saturday, October 27th from 2:00 p.m. to 5:00 p.m. You and the kids can find your way out of a corn maze, go on a hay ride, join a scarecrow building contest, compete for the best costume in the costume parade, play games, jump in an inflatable, play outdoor laser tag, listen to music, grab snacks from food vendors, and explore local businesses at their booths. And if that’s not enough fun for you, head on over to the WS Rec Center for their Halloween Hoopla. They’ll have Halloween games for penny candy, a haunted room, and face painting until 6:45. Then, at 7:00, the whole family can enjoy what seems to be a new Halloween tradition and watch Coco together in the gym. And if you have a junior high or high school student, have them contact the rec center for volunteer opportunities. One of the best things going in our area in October is the Brookfield Zoo’s annual Boo! at the Zoo event. The last three weekends in October (13-14, 20-21, and 27-28 this year), the Brookfield Zoo transforms in to what they call a “not-so-scary and fun-filled” place for families to participate in a plethora of activities, including a corn maze, hay rides, scarecrow building, professional pumpkin carving demos, and the exciting “Pumpkin Smasher!” There is a costume contest, of course, and all sorts of zoo chats about spooky animals. And while Boo! at the Zoo may be Brookfield’s signature event, don’t forget about Monsters on Main Street! Head over to the Grand Boulevard and Broadway business districts on Saturday, October 27th between noon and 3:00 p.m. for trick-or-treating. At the Grossdale Station, you’ll also find a costume contest and giveaways for pumpkins and taffy apples. No matter what you love about Halloween, the La Grange, IL area has it! The La Grange area goes big for Halloween! I hope you found something you and the family will enjoy this year no matter where you live. Since our area is so well connected by road, bus, and rail, you can get to any of these events. The only limit is your imagination. So start building your costumes now and practicing your pumpkin decorating skills. Have a safe and happy Halloween from Nancy Miller!